Sienna Miller at a "Just Like A Woman" screening in N.Y.
Steve Buscemi and Sienna Miller in "Interview." Sienna Miller and Charlie Cox in "Stardust." The lovesick Tristan (Charlie Cox) is always at the beck and call of the beautiful Victoria (Sienna Miller) in "Stardust." Sienna Miller and Steve Buscemi in "Interview." Sienna Miller at the "Factory Girl" UK premiere. Sienna Miller at a special screening of "Interview". Sienna Miller at the "Factory Girl" premiere after-party. Sienna Miller at the 64th Annual Golden Globe Awards. Sienna Miller at the Glamour Awards 2007. Sienna Miller at the 2007 Palm Springs International Film Fest Awards Gala - After Party. Sienna Miller at the Orange British Academy Film Awards. Sienna Miller at the Metropolitan Opera 2006-2007 season opening. Sienna Miller at the ck Calvin Klein new fragrance launch. Sienna Miller at the Isle Of Wight Festival 2007. Sienna Miller, hosting the Marchesa & Bergdorf Goodman dinner. Sienna Miller at the "Factory Girl" premiere. 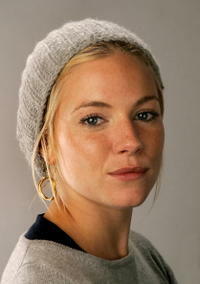 Sienna Miller at an "Intervierw" 2007 Sundance portrait session. Sienna Miller at the SBFF opening night premiere of "Factory Girl." Sienna Miller at the Weinstein Company's 2007 Golden Globes after party. Sienna Miller at the "Valentino In Rome, 45 Years Of Style" dinner. Sienna Miller at the Cartier private "LOVEDAY" party. Sienna Miller at the SAG Foundation brunch honoring Sydney Pollack. Sienna Miller at the 18th Annual MTV Movie Awards. Sienna Miller at the press conference of "G.I. Joe: The Rise Of The Cobra." Sienna Miller at the "Montblanc Signature for Good" Charity Initiative. Sienna Miller at the photocall of "G.I. Joe: The Rise Of The Cobra." Sienna Miller at the special screening of "G.I. Joe: The Rise Of The Cobra." Sienna Miller at the Japan premiere of "G.I. Joe: The Rise Of The Cobra." Sienna Miller and Rocsi at the BET's "106 & Park." Sienna Miller as The Baroness in "G.I. Joe: The Rise of Cobra." Keira Knightley and Sienna Miller in "The Edge of Love." Sienna Miller in "The Edge of Love." Sienna Miller and Dennis Quaid at the photocall of "G.I. Joe: The Rise Of The Cobra." Sienna Miller in "Just Like a Woman." Sienna Miller at the ShoWest awards ceremony. Sienna Miller at the First Light Movie Awards. Rachel Nichols and Sienna Miller at the special screening of "G.I. Joe: The Rise Of The Cobra." Channing Tatum, Sienna Miller and Stephen Sommers at the photocall of "G.I. Joe: The Rise Of The Cobra." Marlon Wayans, Sienna Miller and Channing Tatum at the BET's "106 & Park." Matthew Rhys and Sienna Miller in "The Edge of Love." Sienna Miller and Rachel Nichols at the photocall of "G.I. Joe: The Rise Of The Cobra." Sienna Miller at the El Corte Ingles store in Madrid, Spain. Sienna Miller at the Elle Style Awards 2009. Sienna Miller at the New York Stock Exchange opening bell. Sienna Miller at the BET's "106 & Park." Channing Tatum and Sienna Miller at the photocall of "G.I. Joe: The Rise Of The Cobra." Sienna Miller at the New York premiere of "American Sniper."